NeeNee is lazy. Thus I’m calling Shigeyuki “Shige” and Kazushige “Kazu” from now on. Koya is outside in the Numata’s garden doing radio excercises. Shinichi and Kazushige watch this in wonder. Koya is definitely not normal. What was their first clue? Kazushige’s main complain is that Koya is doing these while facing the house. Sometimes he’ll meet Koya’s eyes and the younger main will laugh. Meanwhile, Kayoko recalls the crazy and odd behavior of Koya the other day with Shigeyuki. How can he put on such a face after his crazy and scary antics the day before? 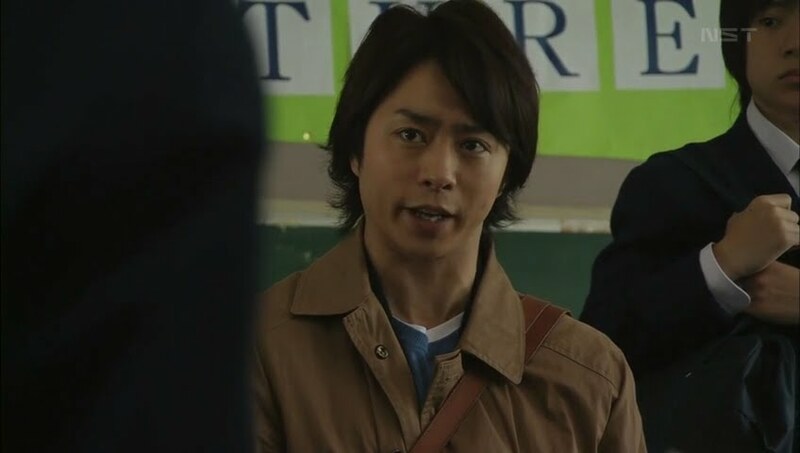 Shinichi then says that Koya is only there to monitor whether or not Shige goes to school This is news to Kazu. Kayoko reminds him that she told him the other night, but he was probably too drunk to remember. Kazu flashes back where the young woman stopped him after work. She introduces herself as Asami Maika [Kutsuna Shiori]. It looks like they work within the same company. She then invited him out for a drink. Kazu says he only went out with a subordinate who had a question—it couldn’t be helped. Right. Kayoko wishes her husband to get rid of Koya. But what about the breach of contract fees? Shinichi complains about his father not reading the contract carefully before signing. Kazu says it couldn’t be helped as it was dark out and he couldn’t see the best. 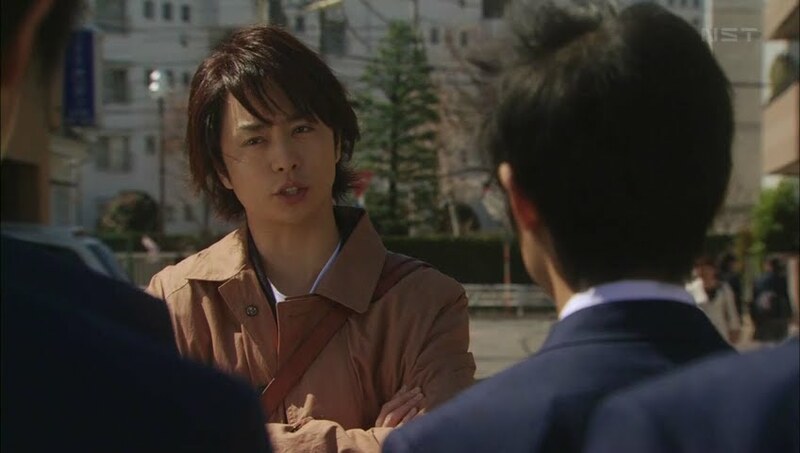 Plus, he didn’t want Koya loudly reading off all the contents in front of his office building Shinichi believes this to mean that Koya ambushed his father and tricked him into signing, but Kazu says that is not possible. Given Koya’s personality it is perfectly possible. Koya then comes in singing loudly. He does greet the family, but before Kazu can talk to him about the contract Shige comes downstairs surprising everyone. Koya gives his evil little grin and says his catchphrase “Good.” He ushers Shige to the table and says they can go to school together after the boy eats. This surprises the Numata family—Koya will go with Shige? Koya sits down and complains that “mother” didn’t make any food for him. LOL. 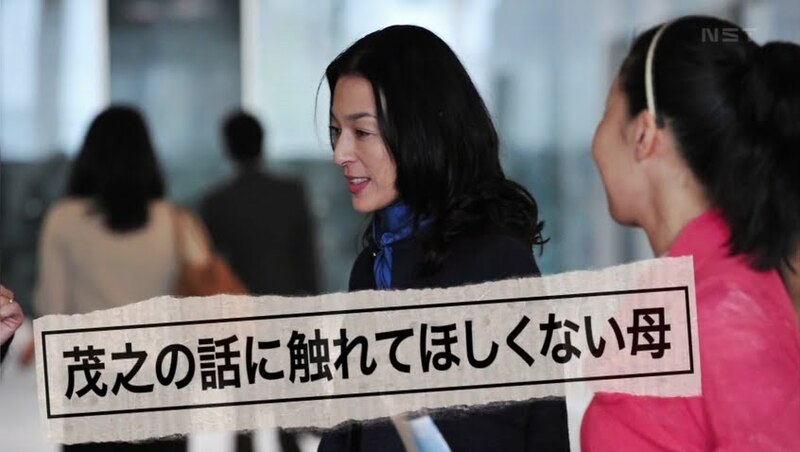 Kayoko says she will make it right away and her husband quietly whispers that it seems Koya is a good man who is only there out of concern for their son. Kayoko says it is all a façade, but Kazu doesn’t listen and heads off to work while Koya puts in his breakfast order. Poor woman, she’s being treated like his personal cook. Koya takes Shige to school. The boy recalls Koya’s earlier words about murdering someone. He then asks if Koya will really quit if he manages to go to school for a week. Koya asserts he will keep his word; however, if Shige is absent one day then he will be forced to face a penalty. What penalty? He will become Koya’s dog. Dog? Meaning he’ll be compliant to Koya. Shige definitely doesn’t like this idea. He marches into school as Koya loudly shouts his goodbyes. 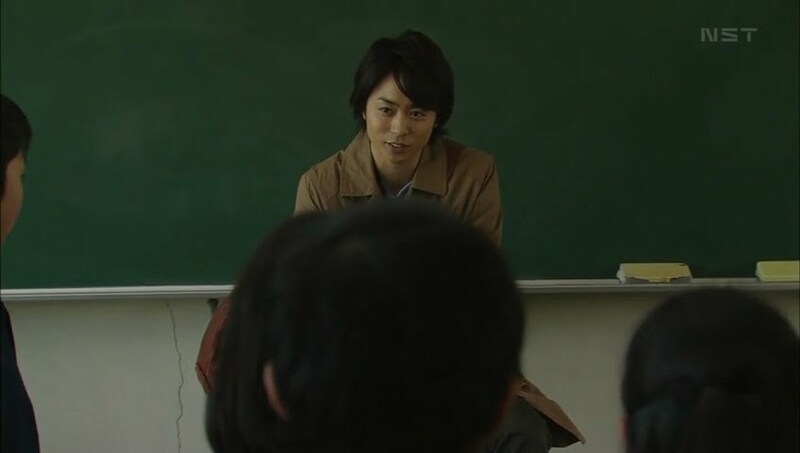 In the classroom, there is new graffiti on Shige’s desk along with thumbtacks on his chair. When he goes to take the thumbtacks off he can’t—they’ve been glued on! Geez. These bullies. Of course the teacher comes in to start class. 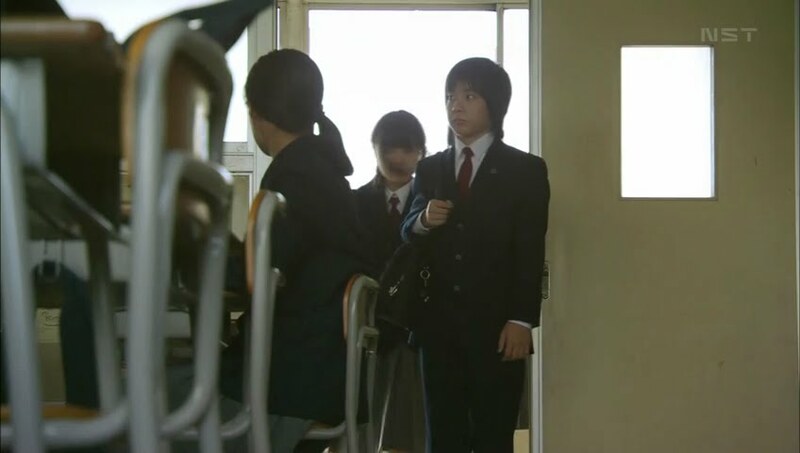 Shige remains standing and the teacher tells him to sit. Shige goes to tell him why he can’t, but the bullies speak up and start teasing him for being so stupid as not to know how to sit. The teacher says nothing to the boys beyond telling them to be quiet. Shige reluctantly sits down only to spring up when the tacks pierce his poor bum. Koya takes photos of all this from the rooftop across the way and says his standard “good.” What’s so good about that? After school, Shige is shoved into the wall by another boy who then complains Shige broke his limited edition cellphone (which is really an old not special model). Shige responds by saying it wasn’t his fault since the other boy bumped into him. The bully’s friends back him up and the bully asks for 30,000 yen (roughly $300). If Shige can’t pay it, then his parents can. The bullies leave where they run into Koya. Sono explains that he is Shige’s tutor. Koya then asks if that group is bullying poor Shige. Of course they won’t admit this. Koya then says they are going about doing tings the wrong way. Again, they don’t listen. Koya then takes the ring leader’s arm and bends it behind his back. He should really hear Koya out until the end. What is he up to now? At home, Shige asks Shinichi for money. How much? 5,000 yen for the time being. Shinichi takes out the money, but before he hands it over he tells Shige he doesn’t have to go to school if its too painful. Shige replies that he’s fine since it is only for a week. Is it because of Koya. Yes, because Shige doesn’t wish to be killed. What? Koya said he killed someone. Enter Koya who reminds Shige that knowledge was supposed to be a secret. He then apologizes for being late and asks Shige if they should get started. 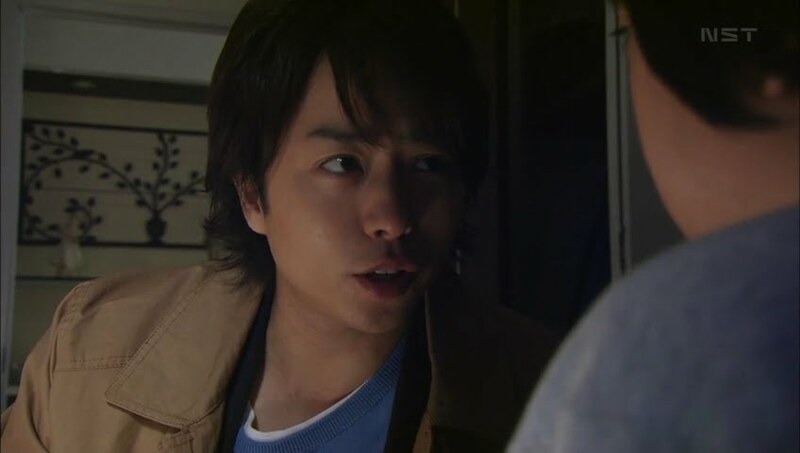 The two get to Shige’s room and the young boy is not happy when Koya closes his bedroom door. So…what subject should they start with today? Japanese writing. Koya hands over a piece of paper and tells Shige to write all about the bullying from when he arrived in the morning to when he left in the afternoon. Shige is adamant he is not being bullied. Right. Like that’s believable. Koya leans over Shige with his evil smile. If Shige lies Koya will hit his bum with a baseball bat which will be an effective punishment today. Oh, wow. When he’s done, Shige reads out all the various bullying incidents to the ones we’ve already scene with the ones that happened during the day that we didn’t. While he’s reading, Koya lies down on the boy’s bed and falls asleep with a smile on his face. Can Koya’s methodology really help the boy and his family? The next morning Koya is doing his radio exercises in the garden once more much to Kazu’s annoyance. 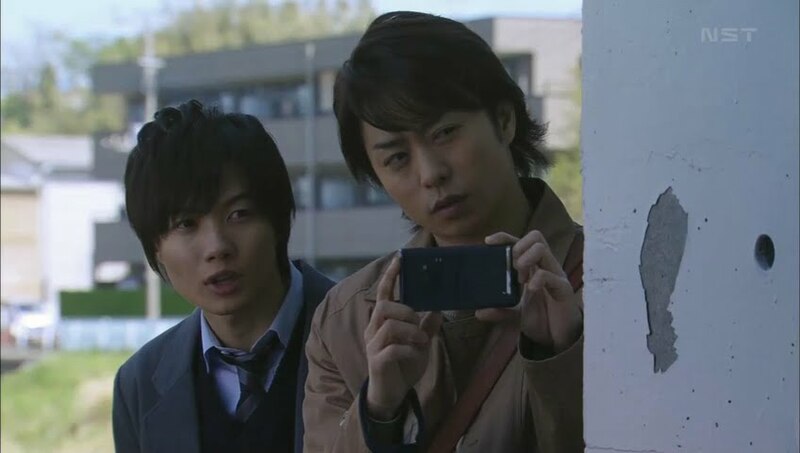 Shinichi then reveals that it seems like his little brother is being bullied again since he asked Shinichi for money. When Kazu asks who, Shinichi doesn’t know, plus there is no evidence. He just believes it’s happening. Kazu wonders if they should ask Shige. Shinichi tells them not to since Shige would have told them if he had wanted them to know. Shinichi then leaves and his parents wonder what to do, but they just don’t know. Shige comes downstairs and instead of saying anything, Kazu just leaves. What an arse. This, of course, upsets his wife who puts on a smiling face to greet her younger son. I have no idea what Koya is thinking, but he smiles and says “good” again. This time Koya stalks Kazu who goes to eat lunch with Asami who talks about how Kazu is being underestimated by the company and should be in a better position than human resources. She apologizes for talking too much and Kazu wonders why she’s talking about him. Asami smiles and wipes food from his mouth saying that side of him is cute. He is then labeled as the father who doesn’t care about Shige at all. I’m guessing these are Koya’s labels. 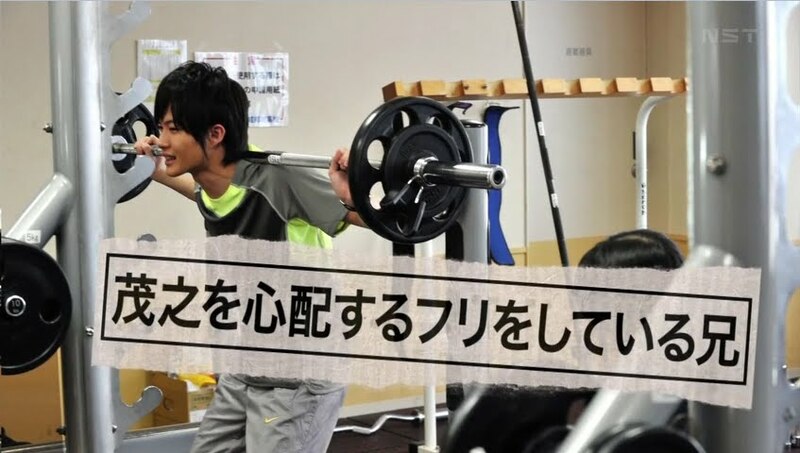 We then cut to Shinichi doing some weight lifting and talking about how he’s worried about his little brother and the bullying, He is then labeled as the older brother who pretends to worry over Shige. Then we see Kayoko coming out of the stock seminar. Her neighbors ask after Shige and she lies and said the boy just fell (the loud crash they heard when Koya shoved the boy into the glass shelves). She is labeled as the mother who doesn’t want to talk about Shige. When Kayoko leaves the women immediately start gossiping about how Shige must be acting out in the home after being bullied. Looks like everyone has already seen beyond their happy, perfect family front and they just won’t admit it. Kayoko then turns and there is Koya taking her picture. He smiles widely and says it is a coincidence to meet her there as he just developed an interest in net stocks. 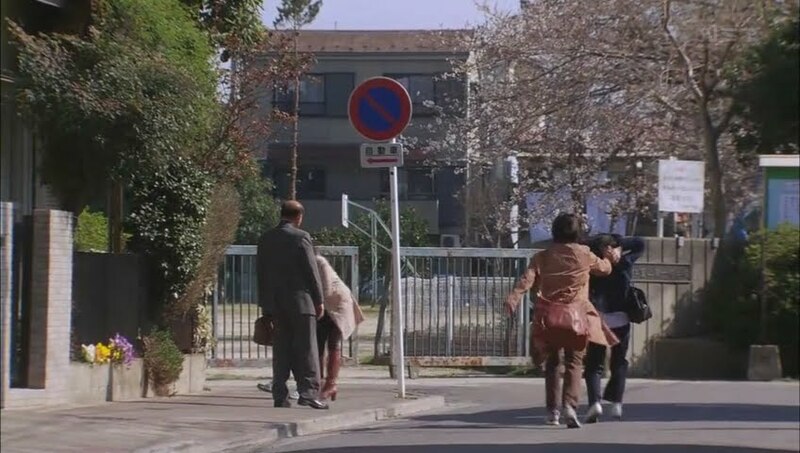 Kayoko rushes out, but Koya follows her. She must be going through a lot because of him, her sons, and her husband. What about her husband. 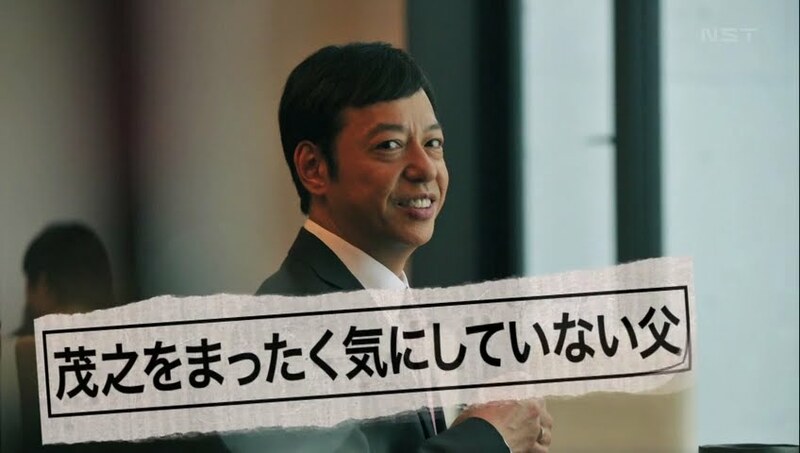 Koya says nothing more than Kazu’s ties are getting flashier and saying he has a suspicion. He then asks about the neighbors and Kayoko bitterly says they talk about things which they do not understand. Ah…so then what does Kayoko understand? Koya then complains about parents who only watch their children and don’t intervene or take interest in their lives (sometimes in order to not be hated). Is that how Koya sees her? Koya acts surprised…is that how she took it? He then says that since teachers lost a lot of authority there is now no one to thoroughly scold kids when they need it. The bullies gather around Shige who hands over what little money he could get. The bullies then say they were told of a new way to make Shige pay. One yen for each hit. Thus they surround and begin beating the boy. Shakes head. So wrong. At the Numata home, Koya is playing Jenga with Shinichi who asks if Koya really killed someone. Why? Is the teenager worried? Of course not since he knows Koya was only lying. Koya refutes this. He really did kill someone. He then asks what Shinichi thinks it would feel about if you are on the brink of dying. Shinichi says he wouldn’t know because he never thought about it. Koya says he expected that answer and the darkly tells Shinichi that it’s his turn. The game is interrupted by Kayoko crying out Shige’s name. 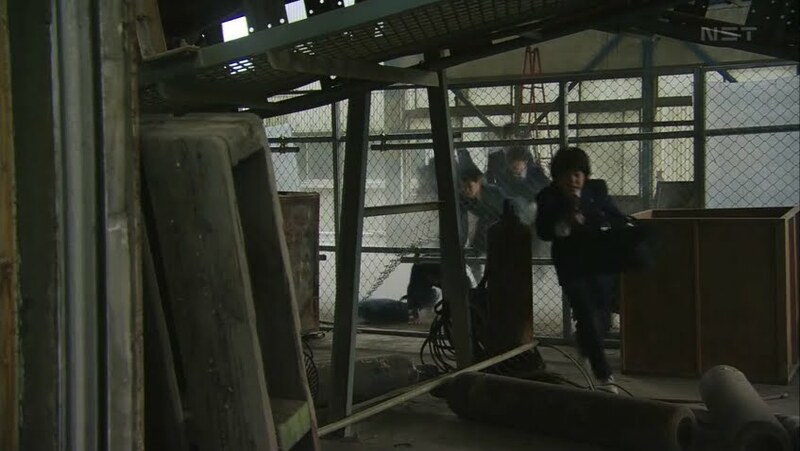 Shinichi and Koya rush down to find a collapsed Shige. The boy gets up and asserts he is fine, but Koya stops him from leaving and tells him to undress now. Shige refuses but Koya grabs him and forcibly lifts his shirt exposing the bruises. Kayoko asks who did that to him and Koya jumps in. What will that do? Will she call the school to have the teacher scold them? Does she think that will stop the bullying? Kayoko cries and asks what she should do then. Shinichi calmly (and quite coldly) says that the best thing is to wait and see what happens. Shige should rest for now and just continue to go at his own place. Wow. A mother who is useless and an older brother who could really care less and will just sit back and watch his little brother get bullied. Sigh. Yep, definitely a screwed up family. This wisdom from Shinichi makes Koya burst out laughing. Does Shinichi really think a person can become more positive after resting? People who can start over don’t even stop in the first place. He then takes Shige and drags him away. Today they will have some extracurricular lessons. 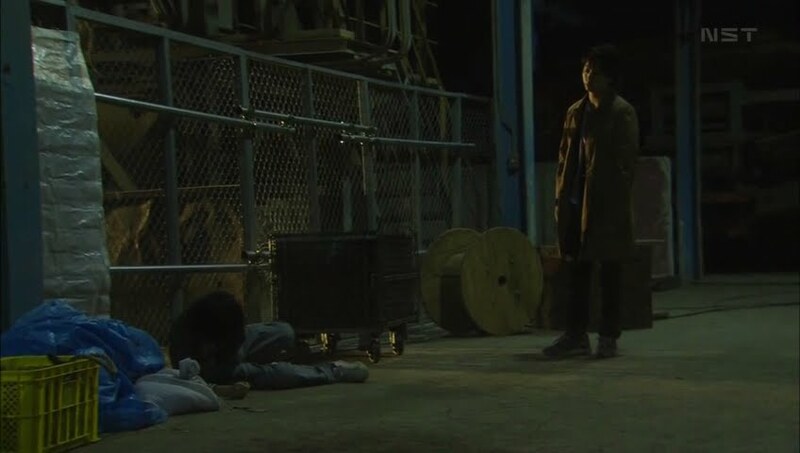 Koya takes the boy to the factory where he was beaten. Why does Shige think he’s bullied? Because he’s weak. No because the boy doesn’t have the will to fight. Shige needs to show his fangs a bit to make the bully falter. Koya then headbutts the boy. Ouch. Koya says this is the best way to make an opponent lose their will to fight. He then crouches down at Shige’s level and tells him to try it so his body knows it. Shige refuses and Koya pushes him down. Shige then demands to know why he needs to learn such things. Isn’t this all Koya’s fault? No, it’s not. Koya says that Shige was a pathetic loser since long before he came into the picture. Koya then yells the boy is naïve for locking himself in his room hoping that things will change one day. They won’t. The bullying will continue until Shige dies. 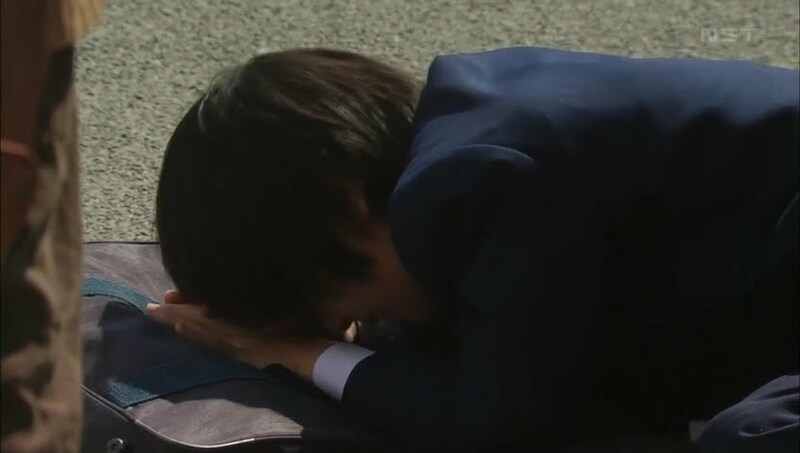 Koya again crouches down at Shige’s level and again the boy doesn’t headbutt him. Koya then shoves him into the fence and tells Shige he will continue until the boy does as he’s told. I think this is all witnessed by Shinichi who is spying on them. Kazu comes home and doesn’t believe the situation is as bad as his wife makes it sound. She wishes for Shige to be transferred, but he tells her its impossible at this time. Enter Shinichi. Kayoko asks her eldest how things are and Shinichi smirks a little and says they were practicing fighting. Kazu doesn’t have a problem with this, but Kayoko doesn’t like this at all. To Kazu, this solution will help settle the incident nicely. He then complains of being too tired to deal with such things and goes to walk away. Kayoko then asks if his taste in neckties changed. Kazu pauses…did it? 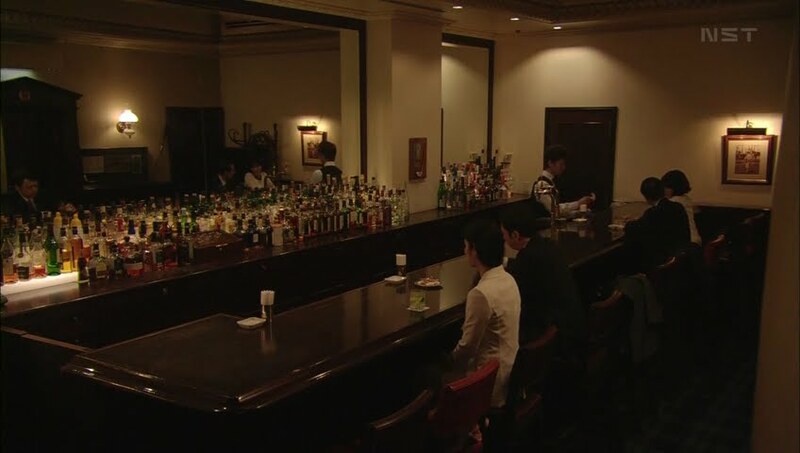 He then continues upstairs while Kayoko twists a rag in her hands and Shinichi watches on in disinterest. Koya is in the factory where he sees a boy who yells him asking if this will atone for his sins? Does Koya really think he can teach someone? Koya turns around and the ghost is behind him with blood dripping off his wrist. Does Koya think what he’s doing right now is right? Koya doubles over in pain and collapses to his knees. At this time Shige calls out to him and Koya covers his mouth. To keep from vomiting or making a sound? 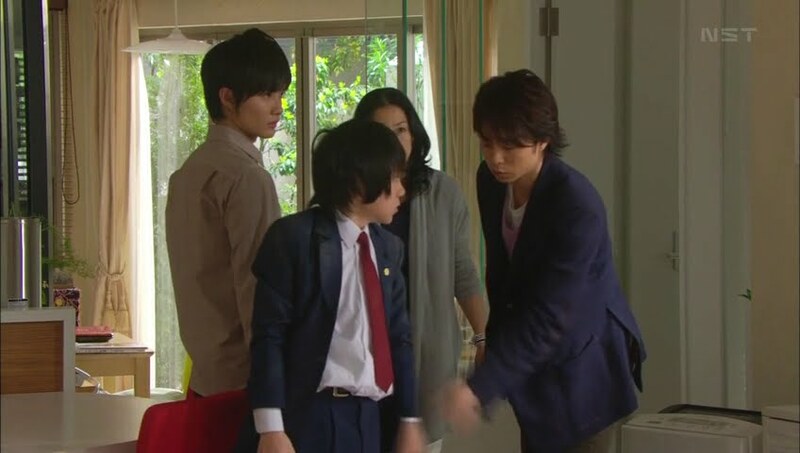 The next day when Shige arrives at school the bullies tell him the debt he still owes. After school they take him back to the factory. Yamao laughs and wonders how much Shige will pay back. He then looks at the smaller boy’s eyes. What’s with that look? Shige says nothing and rears back slamming his head into Yamao’s. LOL. Impressive. But…I never understood headbutting as it hurts you just as much as it hurts your opponent doesn’t it? Anywho, we then flashback to the factory and Koya instructing that there is no way Shige can take on all 5 bullies at once. 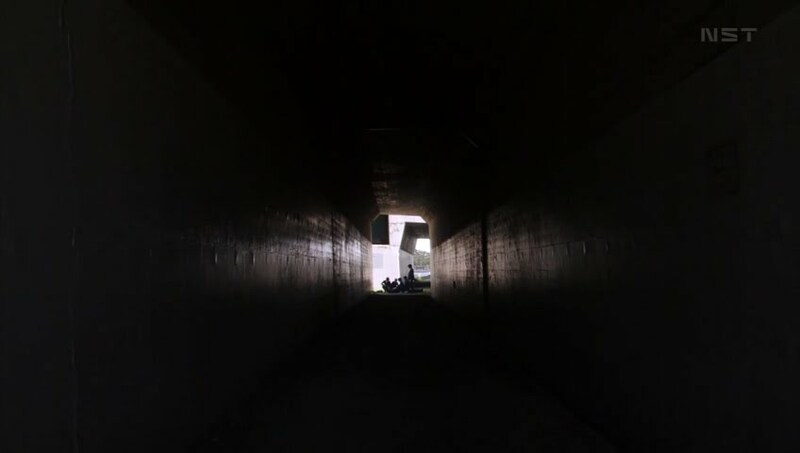 Shige then throws sand in their eyes and escapes through the route that Koya showed him. He runs as if his life depends on it and the bullies chase after him all the way to his house. Yamao goes to throw a rock at the Numata house, but Koya stops him. Today Shige defeated them. But…it’s not over yet is it? Koya grabs Yamao and asks the boy to think of another way. Koya then comes in and holds his hand up to the breathless boy. Shige holds his up in return, but does nothing else. Koya then slaps the boy’s hand and Shige tries to fight back a smile. Koya then marches away while Kayoko asks what is going on. That night Kazu asks Koya in the sauna if Shige fought with the bullies. Koya says he did, but it’s only one step. Kazu says that it may be only one step, but it’s an important step. Koya then asks what Kazu wishes to know. Kazu then asks where you take a 20-something woman to have fun. Is he having an affair? Of course not. Koya smiles and says he knows of a good place with a private room. At first Kazu says he does not wish to know, but he breaks down and asks where. Koya refuses to tell until Kazu admits he’s having an affair. This conversation is interrupted by the arrival of Shige who lets himself into the sauna. Koya demands to know what is wrong and the boy asks for more extracurricular lessons. This makes Koya smile broadly. 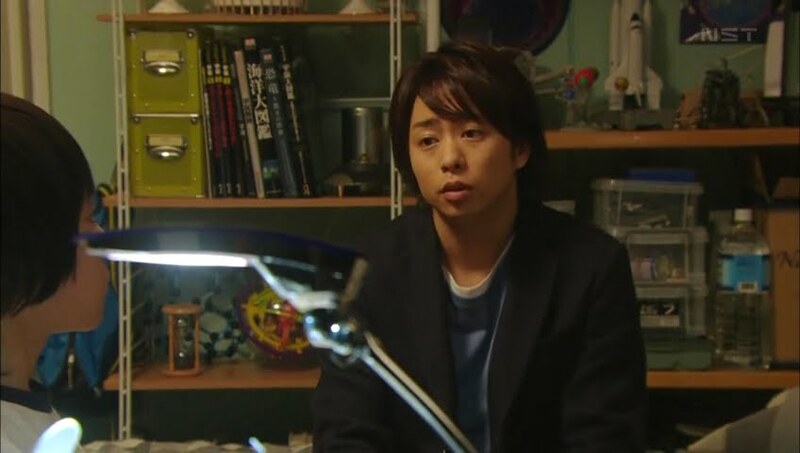 Shinichi is at his girlfriend’s investigating Koya. Since her older brother went to Toudai, he asks her to have him look into graduates from the elite university. 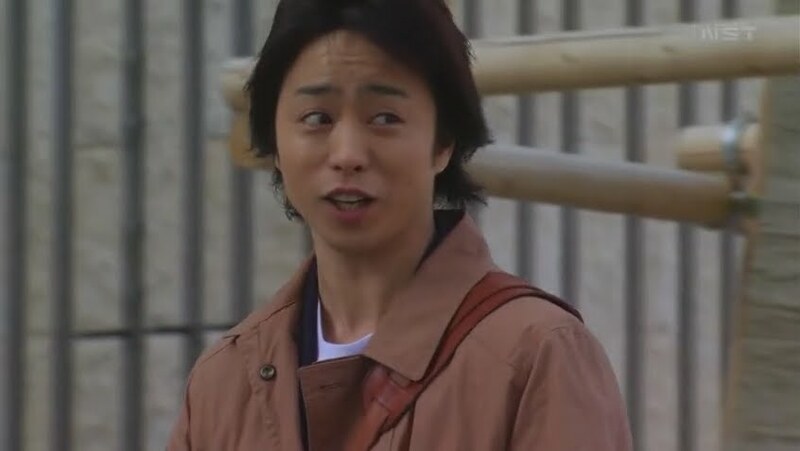 The next day Shinichi stalks Koya like Koya has stalked the Numata family. Of course, Koya knows he’s being followed it. 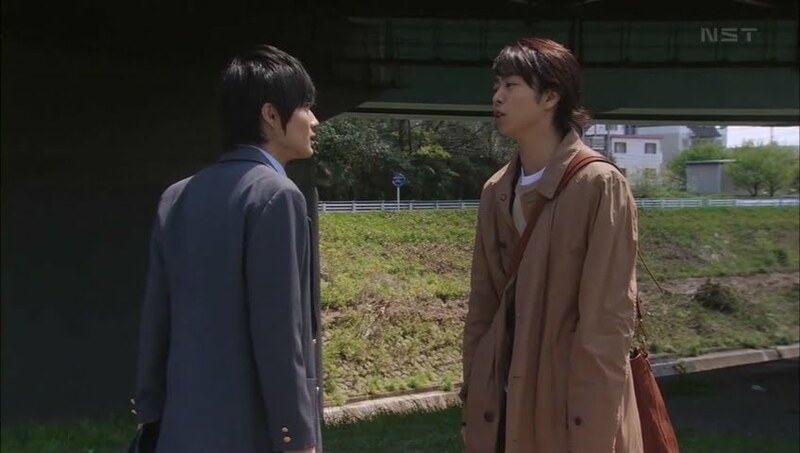 He scolds Shinichi for skipping school to follow him which is definitely NOT the behavior of an honor student. Shinichi says nothing to this and Koya tells him to come along. Where are they going? To watch Shige get bullied of course. 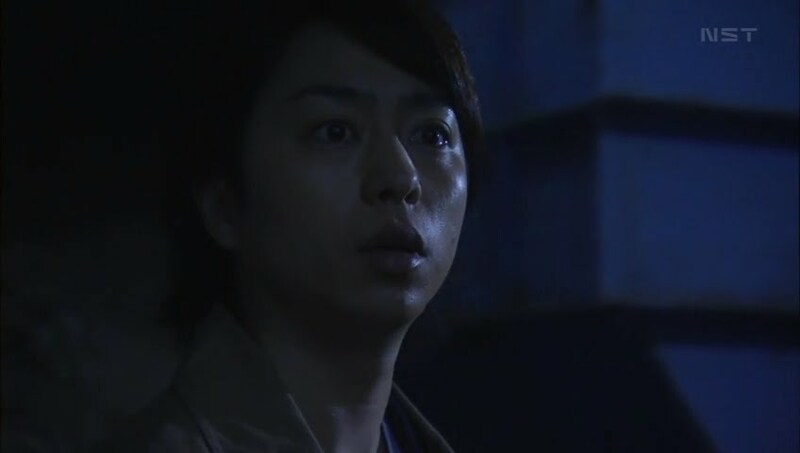 Shinichi is surprised that Koya is just taping the scene and not doing anything about it. He then asks how Koya knew to bring him there. Because Koya showed the place to the bullies. Koya is not happy to see them take out a stun gun as he told them no weapons. Still…he does nothing to stop them. Seeing this makes Shinichi anxious, but Koya tells him it’s fine. 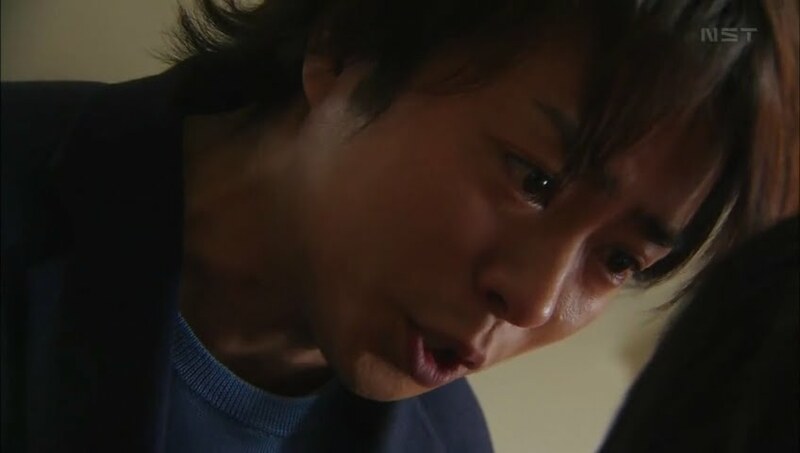 When the abuse continues Shinichi wonders if Koya will really do nothing. Koya explains if he rushes in to save Shige nothing will change for the boy. Koya then looks over his shoulder and tells Shinichi to stop pretending as he wouldn’t step in and help Shige if he was the only one there. While they are arguing, Sonoda is passed the stun gun, but he refuses. Shige then asks for forgiveness, but the boys won’t stop. Shinichi does nothing and looks away. 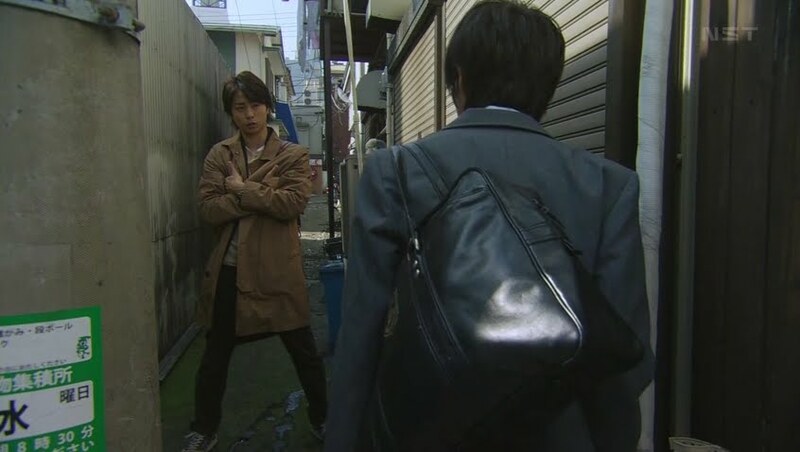 When things continue on, the disgusted Shinichi picks up his bag and goes to leave, but Koya stops him with a dark look. Koya smirks at this. 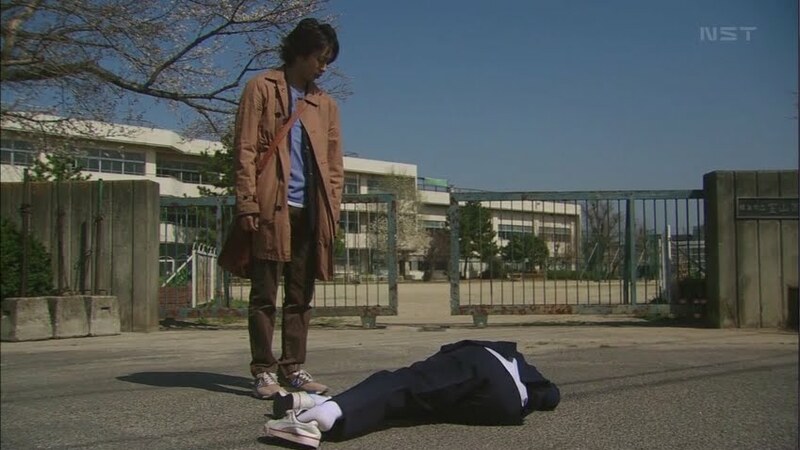 When Yamao starts kicking the boy, Sonoda tries to stop him, but Yamao pushes him away and promises Shige they will do the same thing tomorrow. Shinichi pulls out of Koya’s grasp. What did the tutor tell the bullies to do? Koya replies he only gave them some advice about the way they are doing things being wrong as if they go too lightly, Shige will never succumb. Say what? Since they are bad kids then they should at least do this much, right? Shinichi is horrified by this. Koya does remind the boy that he told them no weapon, but they didn’t listen. Well…Koya supposes they are just at that age. What if Shige dies because of this? Koya smiles saying that Shige won’t die from a self defense weapon (oh, yes, you can die from a stun gun actually). Shinichi calls Koya crazy and rushes off to his unmoving brother. The next day Koya doesn’t show up for breakfast. Shinichi says there is no need for him to monitor today anyways and rushes off to school. Later in the day Koya goes up to Shige’s room and asks what he thinks he’s doing skipping school. Shige says that he won’t be going back to school so he will be Koya’s dog or cat or whatever. So…Shige will do whatever Koya says? Shige nods and Koya orders him to school. Shige says this isn’t what they talked about. Yes it is. Didn’t the boy promise absolute obedience? Still… When Shige doesn’t make a move, Koya forcibly dresses him and pulls him downstairs. Kayoko asks where they are going and Koya replies to school. He drags the boy all the way to his school. Shige shakes him off and tries to escape, but Koya catches him and grabs him by the head of the hair. Shige begs him to stop as it hurts and he doesn’t want to go. The boy then falls in a heap and yells he doesn’t want to die. He sobs and says Koya is right that the bullying won’t stop until he dies. IS he afraid of death? Shige sobs over and over that he doesn’t want to die. Good. Being conscious of death makes you feel alive for the first time. Feeling alive, makes you become kind to people for the first time. Koya smiles happily and says that Shige did a great job, but he won’t give him a reward. He then musses up Shige’s hair more. The classroom quiets down when Koya propels Shige inside. He has Shige stand on a chair and then introduces himself as Shige’s private home tutor. Koya says he is there to speak of the boy’s feelings. Shigeyuki said he will commit suicide if he is bullied again. This shocks Shige. The boys laugh and say Shige wouldn’t dare to kill himself. Koya assures him that Shige is sincere. Wasn’t Shige just trying to determine if he should jump or hang himself? Koya then takes out a paper bag and says he has something for the students. In the bag is an envelope for everyone in the class. The contents of each letter is a suicide note. Koya says it will be left behind if Shige kills himself after the bullying. A student pipes up and says they haven’t bullied Shige so this isn’t fair. Koya angrily responds that even if there are those who didn’t bully Shige, they did nothing to stop it either. Koya then claps and says he has evidence against Yamao and his gang. He pulls out his phone and shows them the video he took the other day of them beating and using the stun gun on Shige. Koya thanks them for using a weapon as if Shige dies, he can send this to the media and the police and then the boys will be considered criminals. And it won’t just be the bullies, but the ones who turned a blind eye to the bullying. The students are angered. Isn’t Koya threatening them? Koya sits on the tachers desk and happily says he is. He tells the class to listen. If he learns that Shige is still being bullied, he will make sure to ruin all of their lies. With his dark look and evil smirk, it seems the students are believing this. It is time for class to start. Koya thanks the class for their attention and leaves. The teacher asks what they all have in their hands and the kids quickly hide the suicide notes behind their backs. The teacher then asks them all to sit. Shige goes to sit down and sees his chair is broken. He raises his hand and says that he cannot sit with a broken chair. Shige then smiles happily. He rushes back home where Koya is sitting eating and watching TV. Koya welcomes him home and then holds out his hand. 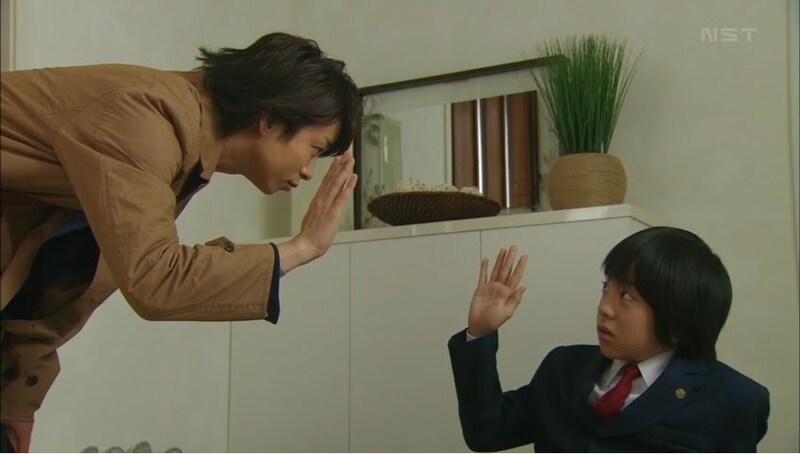 Shige grins and happily high-fives his tutor and goes upstairs. Koya’s look is rather…confusing. His facial expression doesn’t look pleased and looks rather dark. We end this episode with Kazu at a bar with Asami and Kayoko finding a shirt with a lipstick stain. She holds it to her face and screams and sobs. Koya tells Shige to not forget that he is still Koya’s dog. Shige says “hai” and Koya tells him that is not what he’s supposed to say so Shige changes his replay to “wan” which is the Japanese version of a dog barking for some reason. Enter Shinichi with proof that Koya lied about being a Toudai graduate. Shinichi points out that the Yoshimoto Koya in the picture is no the same. So who is Koya really? Koya gets off the bed with a smirk. End episode. Given Koya’s bent personality…shouldn’t Shinichi be slightly afraid of confronting him about his truth or lies? I’m even more curious than ever about Koya’s past now that we’ve had his “ghostly” student show up. Koya seems like the devil’s advocate, just a really extreme one. I also wonder just who he is and why he is doing all of this. I feel bad for the mom, I think she is gonna snap really soon especially now that she’s suspicious of her husband’s affair. Yes, definitely an extreme devil’s advocate. I wonder if that “ghost” is a classmate or a former tutee? I agree that the mom will snap soon. The dad is useless and dumps everything on her and she just doesn’t know quite how to handle it. She may cover up the family problems and not like to talk about them, but I think she genuinely cares about her family.